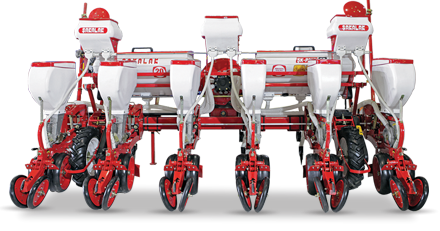 SAKALAK PNEUMATIC PRECISION PLANTER WITH DISCS Is using to sensitive sowing a all types of seeds, providing to sowing to desired row space and distance. Optionally could be 2-4-5-6-7-8-12 serial produced. The seed bearing in the sowing units is opening with disc whereby. In every sowing units two discs (made of special material) is exist . 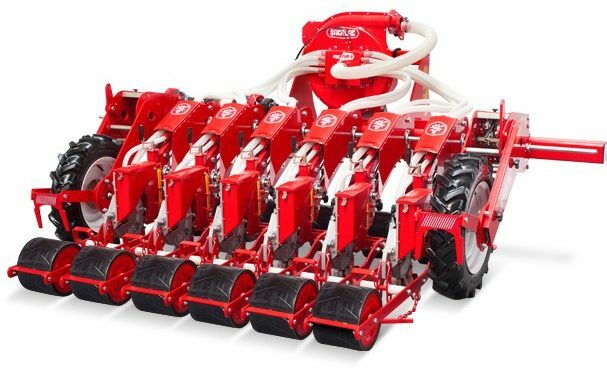 Cause the sowing Units is a disc type and through the cutting discs which is able to mounting to front of the chassis is possible to work on stalk resiudes soil at cultivated or semi-cultivated soils. Cause the the transaction picking up from wheels and delivering it to the shaft mechanism, is possible to make a precision sowing on distances on the rows. Through the wheels at the sowing unit. Is possible to make a depth adjust at all soil conditions. The sowing units is tighting with the screws on V type pressure Wheels placed at the back side. The pressure made by rear wheel and angle is adjust with the arc. Because V type wheels is sliding at the soil is prevent formation of the layer. Disc sowing units at early mellowness of soil is giving a possibility to make early sowing. Pneumatic sowing machines with disc foots is suitable for sowing to the ridge. Doesn’t impair ridges. Cause the seeding bed is opening with the turing discs could not be toughen. Is suitable for growing plant and isn’t give much weight to the Tractor. At required time the units is easy switching to road and working status. Optionally is possible to install a different accessories. With their working speed and flawless performance, saving time and provide a high productivity. 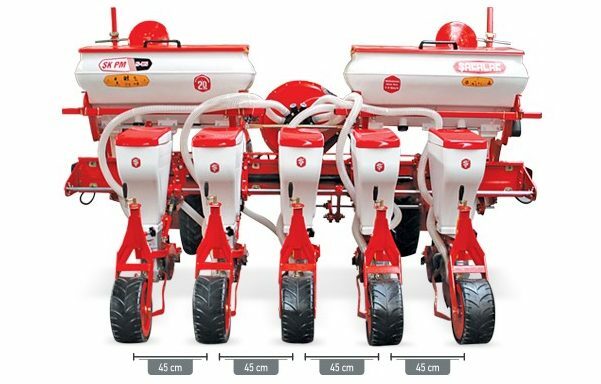 SAKALAK PNEUMATIC PRECISION PLANTER(AXE TYPE) All types of seeds (beet, corn, sunflower, cotton, soy, peanut, melon, cucumber, onion and etc.) precision and in desired sowing distances and giving possibility to sowing on the row in specified distance. Is producing optionally with 2-4-6-7-8-12 rows. Through the sowing units is produced as a Axe is possible to successfully sowing at all soil conditions especially at stony terrain. According beed of small, coarse grains and their dimensions. Optionally Axe is possible to mounting a seed bed openers. Casted axes is made of special frayed alloyed steel cast. For different purposes cover plates is available. For the sowing units of beet onion and etc. Seeds is sow using the inside front wheel pressure. Through the rubber tire at the unit is possible to sowing at all soil conditions, desired distances and equal depth. Optionally: depend on the terrain is mounting width, tine, double and pressure wheels. The pressure adjust of the rear wheels to the soil, is possible to manage with one arm. 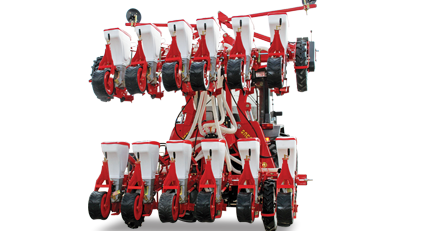 With the deep adjust spring pressure placed on parallelogram unit system is possible on all kind of soil conditions to sowing to desirable depth. At required time the units is easy switch to road and working status. 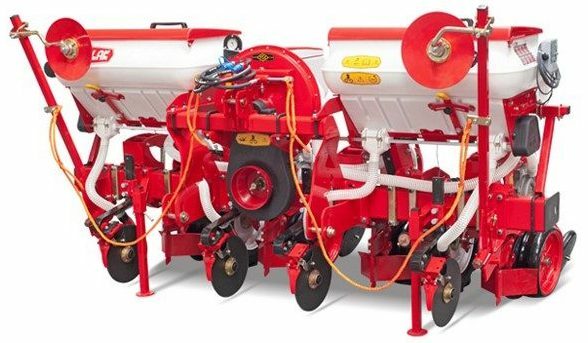 SAKALAK BERAT PNEUMATIC PRECISION PLANTER İs a new designed sowing machine produced to cover needs of vegetable producers in variable agricultural conditions and in a competitive environment. SAKALAK BERAT PNEUMATIC PRECISION PLANTER Especially designed for thin and small seeds, which is heavy to sowing Onion, Parsley, Lettuce, Dill, Celery, Asparagus, Eggplant, Tomato, Pepper, Cucumber, Armenian Cucumber, Okra, Green Peas, Soybean, Cabbage, Brussels Cabbage, Cauliflower, Leek, Spinach, Beet, Radish, Colza, Carrot, Sesame, Cumin, Thyme, Tulips, Dandelion, Chamomile, Elder Flower, Tobacco, Black Cumin Poppy, Husn-u Yusuf, Chysanthemum, Mustard, Saffron and etc. seeds with high performance and with precision. Is an ideal seed drill for producing a vegetables. Is using for by sowing all seeds with and without coat. Is easy to setup a desired distance inter rows. With their slight and strong chassis construction and with design of compact fan. Control and settings of the machine is easy. Paralellogram wheel, unit and Through the self-cleaning wheel system is taken under control a sowing depth. Through the special designed double-acting fan to provide a les highest of falling seeds and precision setup the distance up the row. Separate air circulation and is cleaning plate holes from seed wastes. Mounted on every units Through special discs and sowing feet is possible with every unit to plant in single double triple file. 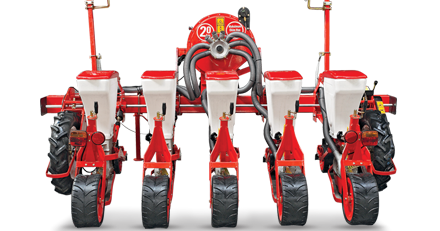 SAKALAK precision pneumatic planter hydraulic shifting, axe or disc type, feet is sowing all types of seeds at all types of soil conditions and desired distance on the rows. 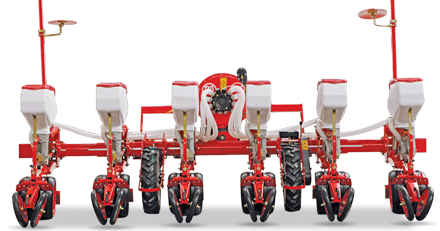 With our hyrdaulic shifting models you can in desired row distances without any removing and installin of parts from the sowing machine. Is possible to adjust the machine just with one touch in several minutes. The distance between rows of the machine from Beet (from 45cm) to corn (until 70cm). through the shifting chassis you can simultaneously open and close. The ŞAKALAK with their hydraulic shifting pneumatic machines is owning all specifications of current disc and axe models sowing machines. Optionally is possible to produce with fertilizing system. 4-5-6 and 8 line up could be produced. Hydraulic controlled shifting chassis is working silent and without vibration. Is a long lasting. Optionally is possible to install a different accessories. with their working speed and flawles performance, saving time and proivide a high productivity. Could throw fertilizers in desired capacity. Is easy to setup, strong and useful one machine. With large capacity of fertilizer and seed hoppers is giving possibility to sowing longer time. The sowing disc is produced with laser technology ad is made of stainless steel. The movement taken from wheels is tansmissing to sowing units is provided by shaft mechanism. That about can make a more better precision sowing. In terms of structure construction, is standard produced.